The Senior Investigating Officer in the Anglo Irish Bank investigation, which has resulted in four bank officials being jailed, has said the gardaí need more powers to investigate white collar crime. Detective Superintendent Gerard Walsh of the Garda's Economic Crime Bureau says the maximum detention period of 24 hours is insufficient time in which to put all the evidence to suspects in custody. He was speaking following the sentencing of David Drumm, whose case comprised of more than one million digital and paper documents. Detectives also listened to more than 80,000 phone calls and took over 400 statements in an investigation that lasted almost a decade. The evidence was gathered as part of Operation Diametre, which ultimately resulted in Drumm being jailed for a €7.2bn fraud that was carried out on computers - between banks - in seconds. What became known as The Anglo Tapes provided crucial evidence for the core team of 18 detectives at the Garda National Economic Crime Bureau who worked on this case for the past nine years. Inspector Catharina Gunne said the calls were on tapes which were forensically transferred to a digital hard drive and all were listened to from start to finish. Six people were arrested in an international investigation that involved the pursuit of covert and complicated financial transactions - through paper, computer, mobile and digital records, in Ireland, the UK and the US. It was a fraud investigation unmatched in scale and complexity. There was no crime scene. The case was a first because it was the first time a crime like this had been committed in Ireland. Four of the country's most senior bankers were convicted and jailed as a result of the inquiry, but it took almost ten years. Head of the Garda's National Economic Crime Bureau Detective Chief Superintendent Pat Lordan said this was because the gardaí first had to establish if a crime had actually taken place before pursuing it. Fraud is not a victimless crime. 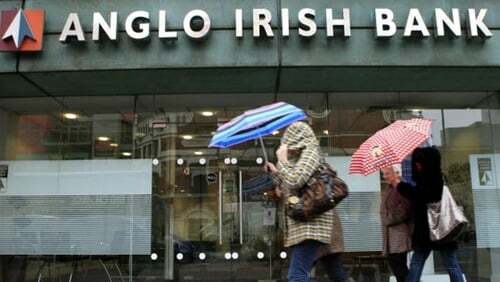 The collapse of Anglo Irish Bank cost €35bn. It is now a subject taught in business schools, but academics and gardaí say the lessons to be learned from this investigation are that more legislation and police powers are needed. Professor Eamonn Walsh from the UCD Smurfit Business School says enforceable rules need to be reflected in new legislation and the law must make "spoofing" in bank statements a criminal offence. Det Supt Walsh said gardaí can only detain people for a maximum of 24 hours in fraud cases and this is not sufficient time to put all the evidence to suspects in custody. But this was not an issue in this case because Drumm was never arrested for questioning about these crimes. He left the country in 2009 and while living in a $2m luxury home in America he refused to be interviewed by the gardaí. He had to be extradited to face these charges and only came back to the steps of a Dublin court in March 2016 after spending five months in two high security US prisons. Drumm is back in prison tonight, this time in Dublin. He will spend the night in a single cell under observation as a first-time inmate at Mountjoy Prison. However he will move from here and will most likely serve out his sentence first in Wheatfield Prison, then in an open prison.